Heartbreak Ridge in Korea as seen from the north. 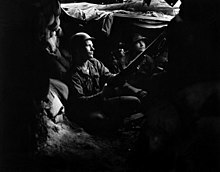 The Battle of Heartbreak Ridge (Hangul: 단장의 능선 전투; Hanja: 斷腸의 稜線 戰鬪; French: Bataille de Crèvecœur), also known as the Battle of Wendengli (Chinese: 文登里战斗; pinyin: Wéndēnglǐ Zhàndòu), was a month-long battle in the Korean War which took place between 13 September 13 and 15 October 1951. After withdrawing from Bloody Ridge, the Korean People's Army (KPA) set up new positions just 1,500 yards (1,400 m) away on a 7 miles (11 km) long hill mass. If anything, the defenses were even more formidable here than on Bloody Ridge. 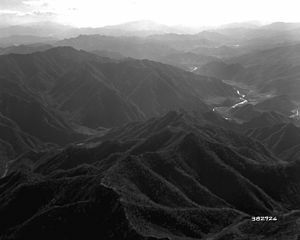 The Battle of Heartbreak Ridge was one of several major engagements in the hills of North Korea a few miles north of the 38th Parallel (the pre-war boundary between North and South Korea), near Chorwon. For the Chinese, this battle is often confused with the Battle of Triangle Hill, which occurred a year later. During the battle of Bloody Ridge, U.S. Eighth Army commander General James Van Fleet had submitted an outline plan, called Talons, to United Nations commander General Matthew Ridgway envisioning an advance of 1–15 miles (1.6–24.1 km) to remove the sag in the Eighth Army's eastern front. Ridgway had turned down more ambitious plans for an amphibious landing near Wonsan and for a deep advance into North Korea, but he had no objection to a modest ground offensive. Preparations for Talons continued until 5 September, when Van Fleet evidently took a close look at the final casualty totals from Bloody Ridge. Since Talons would be on a much larger scale, Van Fleet decided that the operation was not worth the probable cost in lives and matériel. Instead he informed Ridgway that he favored sustaining his "tidying up" on the Eighth Army right flank during the remainder of September, using "elbowing" tactics without any definite objective line assigned. Around 1 October he would stop his offensive operations in the east, then launch an attack in the west by the U.S. I Corps about the middle of the month, provided the armistice negotiations permitted. If this I Corps maneuver were successful, Van Fleet would follow up with an amphibious operation on the east coast near Tongch'on. This would link up with a land advance northeast from Kumhwa. The quick change in plans by the Eighth Army commander surprised Ridgway, but he posed no objection to the continuance of the limited objective attacks on an opportunistic basis. The proposed amphibious assault, however, Ridgway would only approve for planning purposes. Public opinion turned against "limited-objective" operations of this nature, and military censorship resulted in far less media focus on the other October battles that followed Heartbreak Ridge. Sergeant First Class Tony K. Burris of Company L, 38th Infantry Regiment would be posthumously awarded the Medal of Honor for his actions during the battle. The battle is associated with the title and backstory of the 1986 movie Heartbreak Ridge directed by and starring Clint Eastwood. Eastwood's character is a fictional veteran of the battle at Heartbreak Ridge (as is one other character), for which he received the Medal of Honor. The movie itself is a fictional account of events that took place during actual operations in Grenada. The critically acclaimed South Korean film Tae Guk Gi (released in the US as Brotherhood of War) also features this battle as the final battle of the film and the climax. This is evidenced when a South Korean commander, briefing his men, mentions that their objective in the attack is to take Hills 931 and 851. Crèvecœur (Heartbreak) is a French combat documentary by Jacques Dupont, released in 1955 featuring the battle and using actual war footage. It was nominated for the Academy Award in the Best Documentary category for 1955. Heartbreak Ridge (단장의능선) is a map for the RTS (real-time strategy) computer game StarCraft. It was released in South Korea in 2009 and has since then been used in many leagues in the professional StarCraft scene, as well as in non-Korean leagues and in amateur play. In M*A*S*H Heartbreak Ridge is mentioned in episode 9B01 "Trick or Treatment" (Season 11, Episode 2) as the location where the soldiers' buddies named "Bertleson, Wooster, Greenwade" were killed in an empty foxhole during an "early Thanksgiving". French writer Jean Lartéguy fought in the French Battalion and was wounded by an enemy hand grenade during the Battle of Heartbreak Ridge. His novel Les mercenaires (1963) is a highly fictionalised description of the battle. ^ a b c d e f g h i j k l m n o p q r s Hermes, Walter (1992). United States Army in the Korean War: Truce Tent and Fighting Front. United States Army Center of Military History. pp. 86–7. ISBN 9781410224842. This article incorporates text from this source, which is in the public domain. ^ Voorhees, Melvin B. LTC US Army. Korean Tales. Simon and Schuster. NY. 1952: pp. 101–116. ^ "Korean War Medal of Honor Recipients Tony K. Burris". United States Army Center of Military History. Retrieved March 24, 2019.